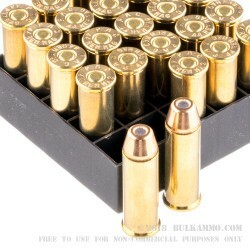 A very simple 44 magnum load for those who want to pick a round and rely on it, for all uses, without having to worry about breaking the bank. 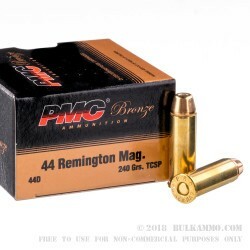 PMC Bronze is a very high quality import ammunition out of South Korea that has been proven year after year in the United States shooting market. 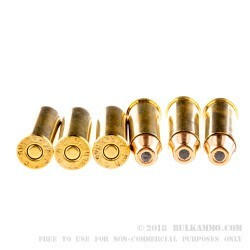 This is their all-around .44 Remington Magnum round for those who want a no-nonsense, no frills hollow point round that can be trusted full time. No shame in shooting this round, because it’s very reliable, relatively clean and offers a significant value in pricing apples to apples for the .44 Magnum. It’s a great range round, but it’s also a great self defense round. Shocker: it’s also a great hunting round. It’s just a great “all-around” round. The more than adequate 1490 feet per second velocity and 1190 ft. lbs. of energy out of the muzzle makes this a very interesting budget purchase. It enhances the rounds ability to do “extra” things like hunting and self-defense. This is not some glorified range round. PMC has proven the reliability it can produce for decades. Finally, the truncated cone hollow point is a very good performer for stopping game or threats.